MOUNTAIN VIEW, California, June 15, 2011 (ENS) – Google is investing $280 million in solar energy to help homeowners afford to bring solar panels into their lives, creating the nation’s largest residential solar financing fund. Google and SolarCity, a solar power and energy efficiency company based in San Mateo, Tuesday announced the new $280 million fund to finance residential solar projects. The SolarCity/Google fund will extend solar lease and power purchase agreement options to customers who want solar panels installed on their homes, but do not wish to make the upfront investment to purchase the systems. The company offers several payment options, including a $0 down SolarLease. SolarCity combines government rebates and incentives into a solar electricity rate the company says is lower than customers’ previous electricity bills and will grow lower by comparison as costs of other energy sourves goes up. Rick Needham, Google’s director of green business operations, said, “We’re investing $280 million to create a fund that will help SolarCity finance more solar installations across the country. This is our largest clean energy project investment to date and brings our total invested in the clean energy sector to more than $680 million. “We’ve also launched a partnership to offer SolarCity services to Googlers at a discount,” said Needham. In SolarCity’s innovative financing model, the company covers installation and maintenance of the system over the life of the lease. The customer can prepay, or pay nothing upfront and make monthly solar lease payments. “Google has made a series of investments in renewable energy because they make business sense and help deploy a range of solutions that can help move us toward a clean energy future,” said Needham. SolarCity serves Arizona, California, Colorado, the District of Columbia, Maryland, Massachusetts, New York, New Jersey, Pennsylvania and Texas, and has more than 15,000 solar projects completed or underway. 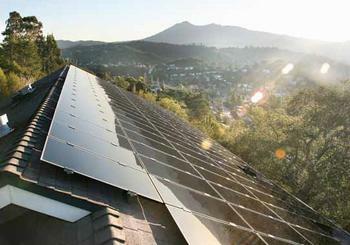 More than 12,000 of those customers have chosen SolarCity’s financing options, while 3,000 have purchased their systems. “Google is setting an example that other leading American companies can follow,” said Lyndon Rive, CEO of SolarCity. “The largest 200 corporations in the U.S. have more than $1 trillion in cash on their balance sheets. Investments in solar energy generate returns for corporate investors, offer cost savings for homeowners, create new, local jobs for jobseekers, and protect the environment from polluting power sources,” said Rive. The fund is SolarCity’s largest project financing fund of the 15 project funds the company has created with seven different partners. In total these funds have financed $1.28 billion in solar projects. The company recommends solar modules for its customers from a variety of manufacturers, using thin film panels or traditional poly-crystalline silicon modules, depending on the client’s needs and budget.